My rate of blog posting has been steadily dropping all year, and for no good reason. It's not for lack of ideas; my drafts folder is overflowing with one-line prompts, half-written posts, nearly-finished material and more. And it's not for lack of time; I find that generally speaking, you make time for what you really want to do. No, it's any number of other lame issues, chief among them probably laziness and lack of discipline. The truth is, I'm not healthy when I'm not writing. I'm pretty sure this blog is a decent barometer of my spiritual and emotional health--when I'm posting a fair amount, I'm in a good place, and when it's quiet here, I'm probably not thriving in real life, either. So I sat down over the weekend and started organizing a list of post ideas. I have WAY more than I can possibly use this month! I'm excited to get going, hoping to get back into my groove over the next 30 days. I'm quite sure I won't sustain the momentum through December, since I've explained how the weeks following Thanksgiving get consumed by online shopping--but I'm hoping to crank out some interesting content this month, take a little break, and then jump back in after the first of the year with all the material I didn't get to use during NaBloPoMo. 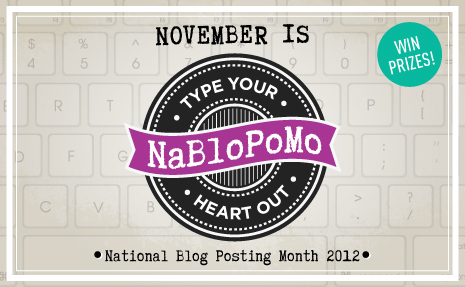 Without further ado...here's to a month of blogging! And I hear ya about the health. If I'm too quiet in real life or on the blog, something rotten's in Denmark. When I get in super foul mood, I want to shut my blog down. Crazy. Some people cut their hair drastically. Some drink to excess. I pull out the big guns. Like who cares??? ?